Described by judging chair David Adjaye, as a “once-in-a-generation project” that “pushed the boundaries of research and innovation in architecture” the Stirling Prize-winning, £1 billion Bloomberg HQ by Foster + Partners also has a claim to being the world’s most sustainable office building. Occupying a full city block, the 3.2-acre site comprises two buildings united by bridges that span a public pedestrian arcade. The building absorbs and honours all the history of its City of London site, re-establishing an old Roman road and incorporating and restoring an ancient Temple of Mithras at its base. It is also utterly modern in its consideration of the way people will experience, enjoy and work in the development – and in its choice of materials and finishes. One of those choices is Corian® Solid Surface. Corian® in Deep Titanium seamlessly wraps the wave-like informal meeting areas of the Stirling prize-winning Bloomberg HQ development in the City of London, by Foster + Partners. Photography courtesy of Bloomberg, all rights reserved. 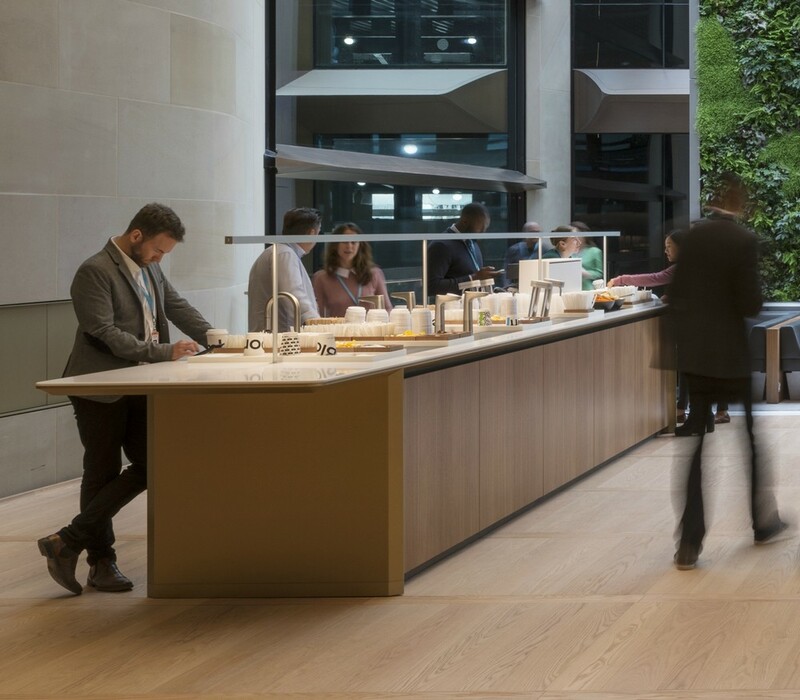 At the working heart of this impressive and yet human-friendly building is a double-height ‘pantry’ on the sixth floor, which Foster + Partners describe as, “reflecting the importance of sharing and collaboration at the company. Everyone passes through this animated space, increasing the likelihood of chance meetings and informal discussions.” In this pantry, Corian® in clean, fresh Glacier White creates the high-traffic countertops that serve the Bloomberg employees and visitors with a robust elegance that is easy to care for and requires minimal maintenance. 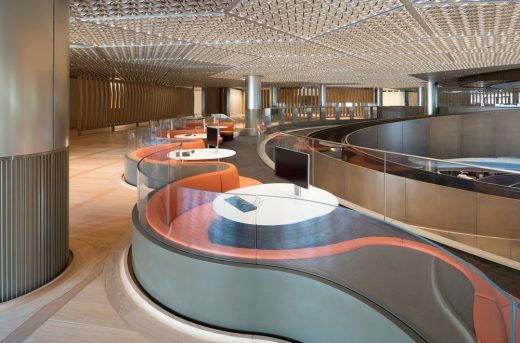 “The notion of teamwork and collaboration flows into the systems and layout of each floor,” say Foster + Partners. 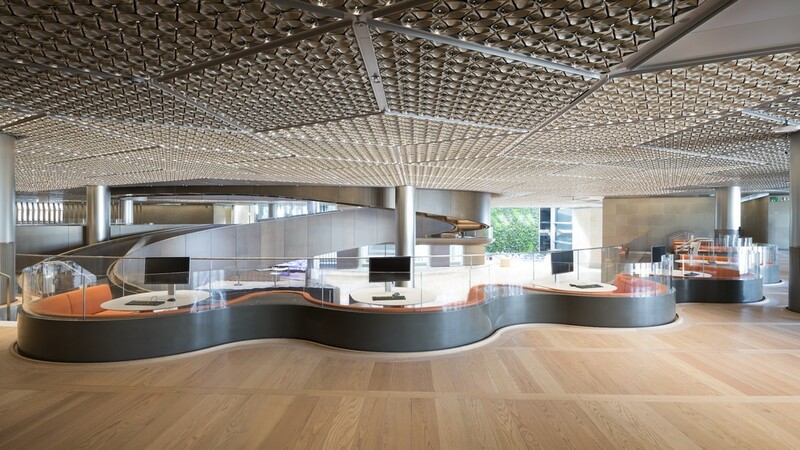 Corian® also plays its part in this sense of open and shared space, lending a seamless flowing finish to the informal meeting area of the building in the form of sleek, undulating cladding in the Deep Titanium colour choice, a dark grey with a saturated, metallic richness of hue. Working harmoniously with other finishes such as bronze and polished aluminium, Corian® proudly takes its place as an aesthetic partner in this award-winning design, while offering all the lasting performance and functionality for which it is renowned. About Corian® corian.uk – Instagram.com/coriandesignuk – facebook.com/CorianDesign – Twitter @CorianDesignUK: From invention through fifty years of evolution, Corian® continues to lead the way in surface design materials. Elegantly versatile and renowned for adding value, Corian® is an advanced material that is stain-resistant, hygienic, easy to clean, durable and renewable. Available in over 100 sophisticated and exclusive colours, Corian® can be shaped into virtually any design and is joined in a way that creates sleek, seamless surfaces. The latest technology is easy to integrate into Corian®, which is compatible with a wide variety of other materials. Corian® has LGA certification for its hygienic properties and is GreenGuard certified for indoor air quality and comes with a meaningful and transferable 10 year e-warranty, offered through a Quality Network of highly trained, skilled and approved partners.